Ballpark Basics: Built for a college team, this stadium could fit right in to the minor leagues. 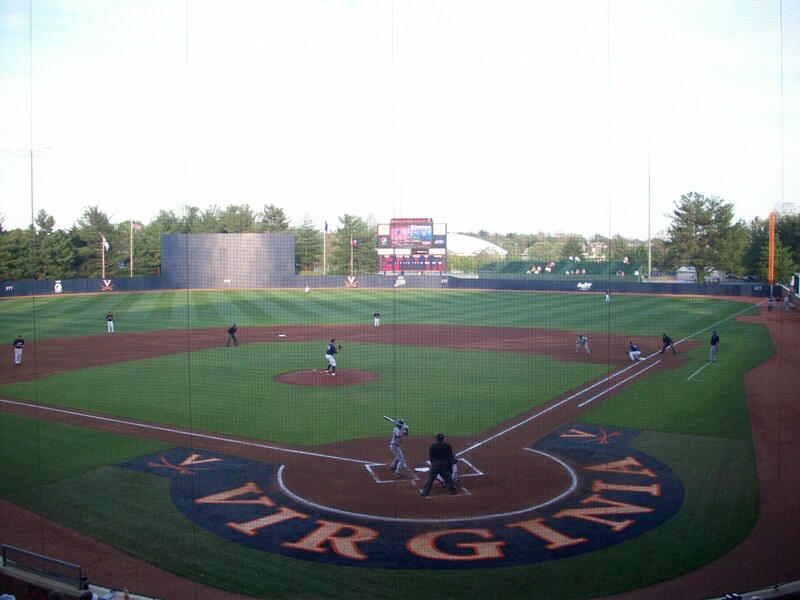 Ballpark Breakdown: Named after Thomas “Ted” Edward Davenport, a former captain and head coach of the UVA baseball team and the executive director of the Virginia Student Aid Fund (VSAF) until 1988, Davenport Field could easily be mistaken for a minor league stadium, not a college one. The success of the baseball team has led to numerous improvements to the ballpark in the last few years. Like many colleges, the baseball diamond is part of a complex that houses fields for lacrosse, field hockey and soccer as well. There is a small box office at the front that serves as the ticket booth for all events, and once inside there is a walkway that takes you past two of the other athletic fields and finally brings you to the entrance of Davenport Field, designated with a labeled archway and flags. 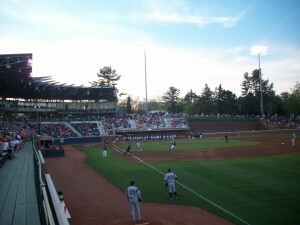 The sidewalk continues down the third base side and past a section of a hill which serves as additional seating, where spectators are allowed to bring their own chairs or blankets. This feature is really a necessary part of the stadium, as UVA’s success in baseball has caused them to quickly outgrow their new ballpark. Originally consisting of 1,500 seats underneath the grandstand with 500 additional seats in left field the continued growth of the crowds made expansion a must. Temporary bleacher seats (which seem to have become a permanent fixture – at least for the time being) have been added along the first base side and in right field. 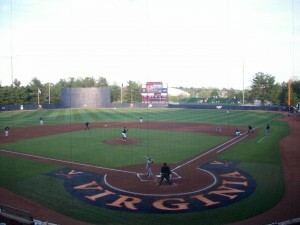 This expansion allowed UVA to host their first Super Regional in 2010 after holding Regional tournaments three times before. 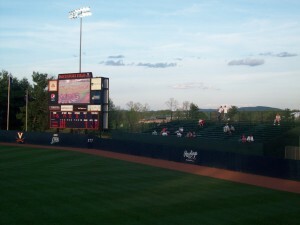 With the expansion, the seating capacity at Davenport Field is now up to 4,825, most of which was in use for the game on the Tuesday evening we attended. The grandstand was constructed with exposed steel and corrugated metal that creates a modern, industrial feel, most notably in the netting which hangs from steel beams that jut out from the grandstand like the arm of a crane. There are six sky boxes that can be rented on a per game basis and all of them were full the night of our game. Built next to a hill, you have to walk up stairs to get to seats on the 3rd base side, and the architects took full advantage of this in the design, including an expanded clubhouse, umpires room, weight room and hitting facility into the ground level of the building. The outfield wall is simple, symmetrical and a consistent dark blue with just the measurement markers and a logo for their 2009 College World Series appearance. 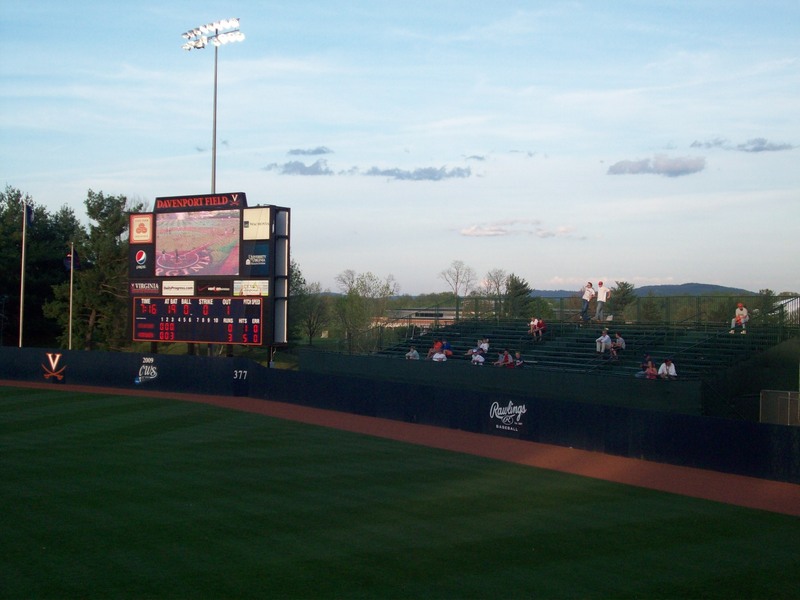 Not only did the have professional level game programs, but the school added a digital scoreboard in 2006 that offers game information including the usual runs, outs and pitch speed and even stats about the players – which is highly unusual at the college level – and made you feel more connected to the team. Little did we know it, but we were in for quite an interesting night when we attended a game here. We were walking up the sidewalk during routine first inning at bat, when University of Richmond short-stop Mike Small slid into second base attempting to break up a double play. We really weren’t even paying attention until we heard the scream. When we looked over in time to see Small fall to the ground, his foot hanging sideways from his leg. He’d slid just a bit too late, caught his cleat on the base, and literally turned his foot all the way around. The poor kid had to wait quite a while (it felt like an eternity to us, and we were just watching) for help to arrive, and we had barely settled back into the game, when the second amazing thing happened. After a couple of quick three up, three down innings with not a lot of action, UVA loaded the bases in the bottom of the 3rd. Danny Hultzen rocketed a ball to centerfield. The U of R centerfielder came in on the ball, missed, and slid as he tried to turn back to get it. The result was the elusive (and first ever for either of us to experience) inside-the park grand slam. Definitely quite a game, and even if yours isn’t as exciting as ours, it was well worth a visit to this anything-but-typical college park. Brew Basics: A lot of potential that falls short in the end. 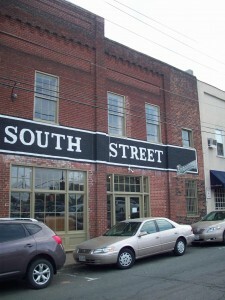 This place is hard to quantify, it really has some things going for it, but there are some definite drawbacks as well. Let’s start with some of the pluses. The building itself is beautiful – it’s a converted factory, whose interior is wood and dark brick, and they’ve incorporated some of the exposed beams and ducts to give it the industrial feel that is so popular these days. A main feature is a double fireplace – that is also two sided and divides the bar from the dining room. 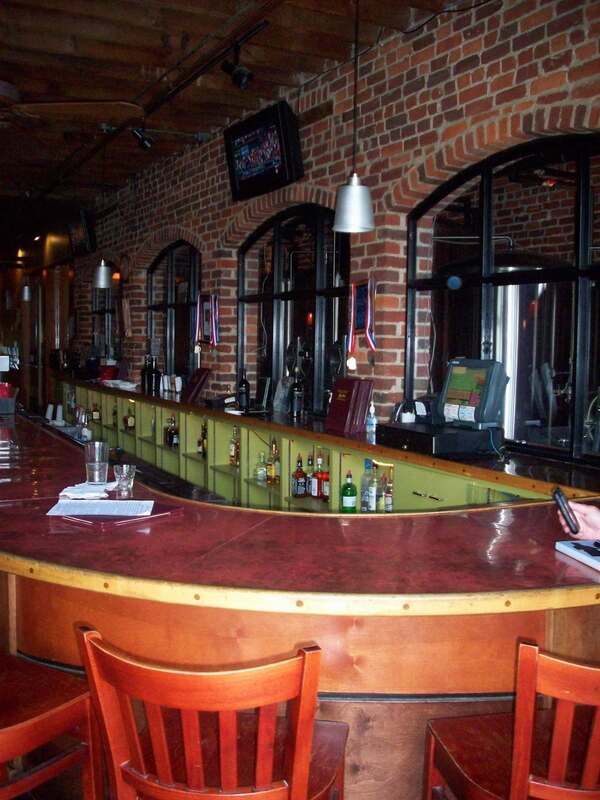 The bar itself is made of copper which creates interesting rings and patterns as drinks are moved around upon it. Sitting at the bar, you face the brewing area, and interestingly, they print up a daily menu with the specials on one side, and what’s currently on tap (and cask) on the other. Drawbacks: To start with, their website is not great, and their hours and prices aren’t much better. The bartenders were busy – even at unbusy times, and were friendly, but had to be engaged. The entry to the building consists of two large glass double doors…but you can’t go in there. The actual entrance to the restaurant is a service entrance wooden door that opens to a hallway, and from there, you enter a second door to get into South Street itself, this just created visible confusion (for not just us!) on multiple occasions. And ladies, no purse hooks at a typically crowded bar. Sometimes, it’s the little things that make a difference. Finally, the place is for the most part, very dimly lit with yellow lights, which made it difficult to see the colors of the beers. That is until some bright white spotlights suddenly came –and stayed – on which made it possible to see the beers, and everything else in the room, through your now squinting eyes. We visited again in the late afternoon, (actually we had to wander around and come back, since they weren’t open at 4:30 on a Saturday afternoon). When they did open their (confusing) doors at 5 there were immediately a handful of patrons, but it was definitely not the same crowd as those hanging out on a Friday night. There was also a different bartender than our last visit, but he really wasn’t any more engaging; however the beers were cold, the décor inviting. I would like to go back in the winter just to see the fireplace in action. 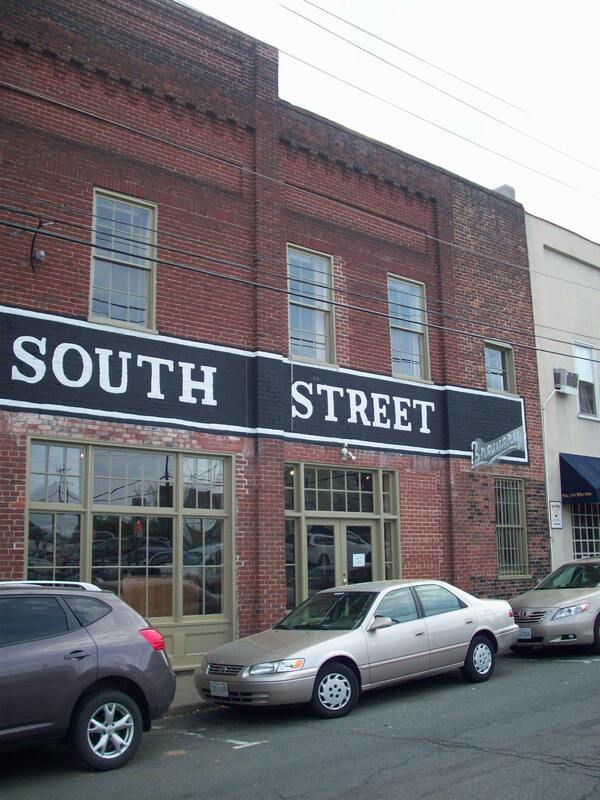 Overall not terribly impressive, but a decent spot if you’re looking for some local craft beer and want to find somewhere to go in Charlottesville that isn’t just a college hang out. All of these beers were very smooth, and with the exception of the Rye PA, also very consistent in flavor from start to finish. Each had solid flavor, but there really weren’t any surprises along the way. Costs were up and down; they have great deals on liter and growler take always, and even have 2 dollar draughts on Tuesday, but we started out with a (fairly pricey) 4 beer sampler, and expanded from there, visiting this place on two separate occasions to make sure we were giving it a fair shake. Satan’s Pony Amber Ale (5.0 ABV/ 16 IBU) – They advertise this best seller as “deceptively smooth” and really, we couldn’t say it better. Satan’s Pony is clean, not watery – but not too flavorful either, with really just a thin coffee taste, and a hint of brown sugar in the aroma. It has a color similar to brandy and is strongly carbonated which is what lingers most on the palate. JP Ale (5.2 ABV/ 42 IBU) – The JP has the distinction of having the highest IBU of any of the South Street beers that were available to us on either of our visits; which isn’t saying much considering it’s only scored a 42 on this bitterness scale. Very smooth- hops are not upfront but simmer throughout the sip. The aroma has hints of sweet fruit, and the color is that of apple juice. This one has leaves lots of lacing on the glass, and is an award winner at many local festivals. Liberation Lager (4.2 ABV/ 14 IBU) – 14 IBUs! The Liberation is plain and light, with more taste than you might get from a common lager. It is slightly wheaty, with a deep golden color. Overall a good drink, but a bit flat. Absolution Ale (6.3 ABV/ 36 IBU) – This one is cherry wood colored, and another South Street beer with very faint aroma. Coffee and malts dominate the flavor, in fact the malt is so strong that it almost overpowers anything else in this recipe. Rye PA (6.0 ABV/ ? IBU) – Strong bitters that last, and change in the middle of the sip, lingering throughout creating a bitter aftertaste that mirrors the first punch of flavor. Definitely the strongest beer in both aroma and upfront taste of those on the menu. Hoppy and unfiltered with a strong brown color. El Jefe Hefeweizen: (5.0 ABV/ ? IBU) – This one was just a pile of adjectives to us, thick, unfiltered and golden yellow. Smooth, cloudy, fizzy and good. Basically a highly drinkable pour, not as sweet or citrusy as many we have tried, which actually served to make it all the more likeable. 420 Stout: (5.9 ABV/ 60 IBU) This one wasn’t available on our first visit, but happily was on our second. Faint coffee notes in the aroma, with an intense dark brown color that was almost ruby when it caught the light. It was served warmer and “on nitrogen”, and has a taste which they describe as rich and smoky. We felt that instead of rich, it was really just thick which helps to fill your belly, but is very different. Really this was almost a “flowy” stout, with no bitters, and a very light, smooth taste.